Effective change management starts with selecting an appropriate model and methodology to follow, then adding the human touch. I’ve talked about the three most widely used models out there, so I won’t spend a lot of your time here, hemming and hawing about that particular aspect change management. Chances are, you’ll pick one of the simpler ones (probably the eight-step model). 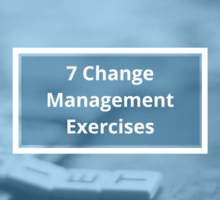 Effective change management is more than just picking a model that works well for the environment and the people you work with. It also requires a human element that not everyone possesses, to be honest. You see, effecting change organically and smoothly in any complex system (especially a business with well-established traditions) is very much an exercise in social engineering. You need to have technical skills with pacing, logistics and efficiency when addressing change. How you approach these changes can determine your outcome. The technical aspect is pretty well-covered and documented; it’s a hard science. But people … well, people are a bigger fish to fry. Even the psychologists will agree with me on that point. Ease of transition is simple it basically requires overcoming apprehension – something even the most eager and willing proponents of change must face. People are insecure; they fear that they won’t understand the new ways of things, they will be confused and fail. This is all about being confident yourself, as a leader so that the picks up on it, which in turn, allow them to be confident themselves. Confident workers embrace change. It’s the naysayers that are the problem, of course. Being a confident leader isn’t going to help here; you’ll have to fight negativity relentlessly before you can progress. The unwilling are there, and you can’t just ignore them. This is where your skill as a negotiator, salesman, and motivator, must be tapped. You will have to work very hard to sell them on why the changes are beneficial to them, and why it’s worth their willingness to step outside their comfort zones – (comfort being the primary cause of rebellion against change). Along with this, of course, you must also work hard to convince them that the changes you are bringing are for the greater good. It’s not an easy job, so those who have weak hearts will have to train themselves for such a challenge. Effective change management begins with a solid strategy and moves along with an understanding of human behavior. I hope this article helped give you some insight into the mechanisms behind effective change. Good Luck!